Hawaii congressional candidate and democratic socialist Kaniela Ing on taking on Hawaii's biggest corporations, a bold climate change agenda, and the necessity of opposing US imperialism. You’d be hard-pressed to find an American elected official as clear about connecting the domestic and foreign politics of US empire as Kaniela Ing. Ing is a State Representative of Hawaii and member of the Democratic Socialists of America (DSA) running for Congress in his state’s first congressional district. Calling for an end to imperialism, as well as rule by the wealthy, strengthened housing rights, a Green New Deal, Medicare for All, and free college, Ing centers how the violence the United States carries out overseas produces oppression at home. Like Alexandria Ocasio-Cortez, Ing is backed by Justice Democrats. And like Ocasio-Cortez, Ing has released a powerful ad tying all his campaign’s themes together, made by the filmmakers at Means of Production. You can watch that video here. Daniel Denvir interviewed Ing about his campaign for The Dig, Denvir’s podcast on Jacobin Radio. You can subscribe to Jacobin Radio here. The interview has been edited for length and clarity. I’m Native Hawaiian. I’m a millennial father, which is rare in politics. And I’m a state legislator. But I’ve been against the grain when it comes to the Democratic Party in Hawaii. I don’t come from money or power. I grew up relying on government programs, working in pineapple fields, working alongside undocumented folks in hotels, working at Walmart. I fight for working families because I come from one. It’s always the elites telling the oppressed to have aloha. And in this campaign, we’re reexamining what aloha really means. If there’s an economy that doesn’t work for people of certain races, or genders, or classes, then where’s the aloha in our society? We need to fight for aloha. That’s actually where the Democratic Party got started from in Hawaii. We were segregated by sugar barons, by race, so we couldn’t even understand each other. We couldn’t organize, [we were] identified by number and not name. The same slave tags were used in the South. There’s a lot of nostalgia about the plantation days in Hawaii, but we should be nostalgic about the struggle, because that’s really what our lives are rooted in. It seems like Hawaiian history is so seldom recognized as part of American history. Hawaii was a site of militant sugar labor organizing among Japanese-Filipino plantation workers, forcefully seized as a US colony in the interests of white settler elites, and has long been a majority nonwhite state. Can you say a little more about your relationship to this history and how it informs the political agenda that you want to bring to D.C.? I didn’t find my way into politics. Rather, as a native Hawaiian, politics found me. It threatened my very existence. I remember my first race, I was twenty-three, and I was nailing in my own lawn sign that somebody asked for. And someone pulled over on the side of the road, and they go, “Oh, you’re Kaniela. You’re so clean-cut. I was expecting a militant.” I was like, “All right, this is what I’m dealing with.” It was one of my first interactions with a constituent. And I ran in a predominantly white district — the whitest in our state. It was also very Republican. It was one of the few Republican districts in the state. But if you knock on people’s doors and meet them where they are, you’ll win no matter what the makeup is, demographically or ideologically. You’re already a state legislator. Now, you’re struggling to be a representative in the US Congress — of a country that colonized Hawaii. Maybe what your politics promise is sort of a revenge of the colonized that also benefits the colonizer, ultimately. Right. Trump may not see it, but there’s a state here in Hawaii. Though many native Hawaiians don’t see Hawaii as a state. Many continue to recognize us as an occupied nation that still has its sovereignty. They’re fighting to be recognized as independent. That still exists. I say to those folks, “That could be true, and I hear you. I know exactly where you’re coming from. It makes sense. But no matter what’s the case, the decisions in the State Capitol and in Congress are still affecting us. Either we’re going to be making decisions or they are.” I think that’s what folks are starting to realize. Native Hawaiians have historically not wanted to vote as much because of this disenfranchisement. We do need to continue to fight for our sovereignty, but we also need to actually shift power where it exists. How did you make your way to the state legislature as a young activist? What have you accomplished there, even in cases where you didn’t succeed? After my father passed away, I got really lucky and was able to get into Kamehameha, a private school for native Hawaiians only, which is continually under threat by white-supremacist forces. I got into this school, which shaped me up — I had to tuck in my shirt — it’s very strict. And I got into college and was a first-generation college graduate. But during my Kamehameha school days, there was a lawsuit that threatened our school’s existence completely. So, that got me involved in native activism. That carried through college as our Republican governor cut $130 million from our university. So, I ran for student president. We fought to restore some funding. I realized you can actually do a lot in this politics stuff. And I saw a Tea Party guy get elected in my home island, Maui, in 2012. He was selling off the rights of our islands to these mainland corporations that funded his campaign. I decided it’s now or never. This Tea Party dude, he wanted to cut all these programs I relied on. So, I took a shot, knocked on 15,000 doors. I was working at Four Seasons at that time: 4:00 AM to noon, a full-time shift, and then just maniacally went door to door until sunset. I wore down a few pairs of shoes, and we ended up winning by twenty-six points. Not only did we win our district this way, but we shifted it, over six years in office, to become a lot more progressive than it was. What have you been working on in the state legislature? At first, there were some low-hanging fruits. There was marriage equality, I helped champion that. A minimum-wage increase back in 2013, before the Fight for $15 started popping up all over. We were really aggressive going for $12.50. It ended up at $10. It’s pretty bogus when you don’t tie the minimum wage to inflation, because then [prices] just keep coming up. We’re still dealing with that now. We passed the nation’s first 100 percent renewable-energy goal. That was by 2045, so it’s too far out, but we got it going for the state. I wrote and passed same-day voter registration to help young people come out. My partner and I wrote and passed a bill to give undocumented people drivers’ licenses. We’ve allowed them to drive so that they’re [not] getting pulled over from just going to work or bringing their kids to school. So, we had gathered the low-hanging fruits, but we also went and proposed things like rent control and a $22 minimum wage (because that’s really what a living wage would be). We tried to push the envelope. I think that was the first time we talked about rent control in over thirty years. This year, we’ve seen five different legislators introduce similar measures because it was just so damn popular. It didn’t pass because there’s no tenant organizing in Hawaii. But maybe if we keep talking about it, some activists will come up and start knocking on doors of their building and get some tenants together, so they can actually compete against realtors and landlords. In a recent debate, you partnered with other candidates in criticizing the role of the military in Hawaii. You’ve also criticized US empire. Explain what you see as the relationship between US imperialism abroad and the place of the military in Hawaii’s society and economy. What you want to do in Congress on both fronts? There’s a proposed reduction by the Pentagon in 2015 of troops on O’ahu. It was the one issue where the unions (specifically the more corporate ones), the Chamber of Commerce, and various elite economists — they all got together and said, “We need to oppose this by all means because our GDP will take a hit.” But we don’t have an under-population problem on our islands. And while a reduction of troops may affect our GDP, it won’t affect our GDP per capita — the amount of money that regular folks actually have in their pockets. And our most polluted sites in Hawaii are on bases. Three EPA superfund sites are on military bases today, including Red Hill, this underground fuel facility that was leaking poisons into our water supply. And rental allowance. You have these officers that have housing on-base, but they opt-in to housing out-of-base and receive up to $3,200 per month for rent — which drives up rent for everybody else, from rent-seeking landlords. We already have a rental and housing crisis here. It’s time we think about what it means to have a war-based economy. That if war were to stop, our economy would stop, and that our livelihoods depend on the deaths of others — it’s abhorrent when you actually think about what that means. We need to transition away to have an economy based on peace. There’s finally a lot of talk about anti-interventionism on the Left, even by politicians. That’s good, but anti-imperialism is even better. As native Hawaiians, we know what it’s like to be displaced from our homeland. Whether it’s a war on drugs or a war on terror, it’s really wars for profit. These wars are causing indigenous peoples all over the world to suffer just like we have. We have to make those connections and realize that it’s our duty to let these refugees and immigrants in — and stop causing the refugee crisis in the first place. Climate scientists now are saying, especially in Hawaii, that we’re going to see a three-foot sea-level rise by the year 2100, and we really only have about fifteen years to act. So, we’ve been one of the champions of the Green New Deal proposal. The goal is 100 percent renewable energy by 2035 nationwide. We’re going to achieve that through a federal job guarantee to retrofit buildings, plant trees, transition folks out of coal and oil and give them even better jobs, and advance [renewable] energy. It’s a win-win for the environment and the economy. In Hawaii, those two things are one and the same. You’ve taken some hits in local media for campaign finance violations. Can you say a little bit about what happened and how you’re handling it? Because this is the kind of thing that political journalists really fixate on. My first race, and actually all my races, it was just me. I didn’t have an establishment helping me. No campaign manager, finance director, fundraiser, accountant, field director, press director. It was all me. So, at the end of the day, I would have to just do everything myself. So I made mistakes. I owned up to them. I didn’t blame it on whoever was listed as my treasurer, I just made sure that it fell on me. And there was no misuse. All the money that went in, went out for proper usage. It’s just misreporting. And the bank records showed that. We went ahead and corrected it. I’m going to have pay a hefty fine, I think about $15,000. I’m not sure how I’m going to afford that, but I’ll figure it out. We hired a team of professionals to make sure this doesn’t happen again. I apologize every time I get a chance. I’m often ashamed I’ve let volunteers and people close to me down. I’d like to say that if I could go back, it wouldn’t happen, but it was really tough. I tried my hardest. Do you think you can push beyond this, with the news cycle and the political debate in Hawaii? I was in office. But this campaign, we went really hard naming names locally, of these “big five” corporations, which come from the same families that had oligarchical control of Hawaii. They’re still in control of our politics here. So, we’re naming their names, like Alexander Baldwin, corporations like Monsanto, Raytheon, Lockheed Martin. These are huge forces in Hawaii politics. They also happen to be the advertisers that pay the reporters’ salaries. So, this campaign has been very different. It’s been an interesting shift I’ve seen, from being a media darling as a young politician, to a pariah. But I think folks are getting it. They understand that donors are advertisers and there’s this cartel of folks that continues to control our state, and we need to rise up. The last I saw, you’re polling respectably but behind. What needs to happen, in your analysis, between now and Election Day on August 11? People need to come out. Momentum has been on our side. I think the reason why they dropped a lot of opposition research early is because we were picking up steam. We had a viral video that got over 9 million views. People are so ready for our message that it just blew up. Let’s focus on our human needs, what’s been missing in the political discourse, and how so many of us are suffering. Eighty percent of us are paycheck-to-paycheck now. Home ownership is a pipe dream because it’s almost $800,000 now for the median, which means you’ve got to be making $200,000 out of high school or college to afford a home. It’s absurd. We can do better. Scarcity is not a problem. We have these luxury condos popping up every month. Individual units for over $200 million. The money is there, it just being siphoned up by the ultrarich, [who are] building for profit and not for human need. We might not have as much money as my opponents. But we have the volunteers. The working people from Hawaii are out, we’re knocking on doors every day. If we continue to have those conversations despite the mistakes I’ve made in the past, we will win. Because, ultimately, it’s not about me, it’s about the issues that people care about. 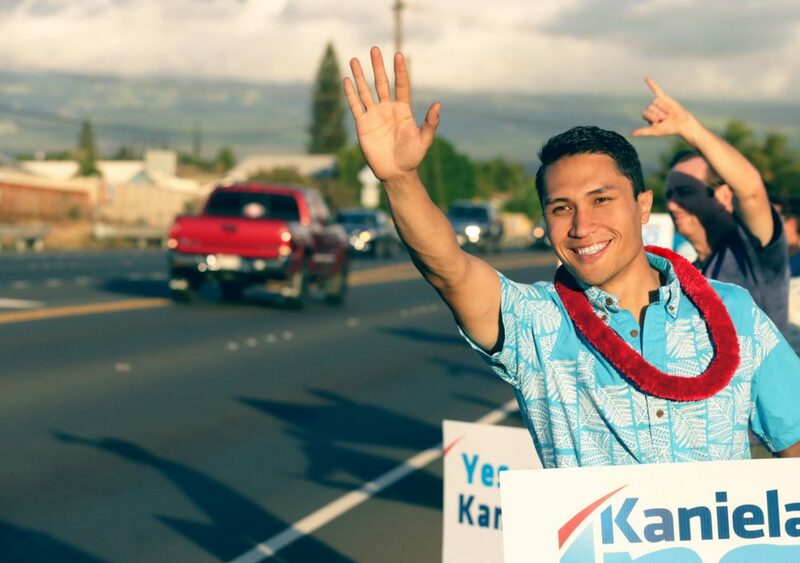 Kaniela Ing is a state representative from Hawaii running for Congress in the state's 1st Congressional district. He is a member of the Democratic Socialists of America.